FAR’s Children of Armenia Sponsorship Program (CASP) has contributed to the betterment of vulnerable families in Armenia and Javakhk, Georgia through the provision of financial stipends since 2000. Children receive support twice a year from individual U.S. donors until they turn 18, thus alleviating some of the financial burden that single mothers often face as they bring up their children alone. After her husband’s death, Anjela Manasyan, 39, from Khulgumo Village in Javakhk, had to cope with the difficulties of living alone on her meager income as a biology teacher. She could hardly make ends meet. “Living in an isolated village is hard enough; being a single mother with three children is even harder, but I do my best to provide my kids with the essentials so that they can lead a happy and dignified life,” she exclaimed proudly, as she introduced her three children, Sos, 15, Venera, 19, and Janna 21. Sos was still a toddler when his father Navasard passed away from cancer at 24. He is now in the 8th grade, and apart from school he also attends boxing classes. Sos dreams of becoming a famous boxer. In 2016, he won the Georgian boxing championship. Since then, he has been on the country’s boxing team. As someone who formerly studied karate, Sos has always been successful in athletics and likes to hang his medals beside his father’s photo. “I want to share my joy and victories with my father,” he said. 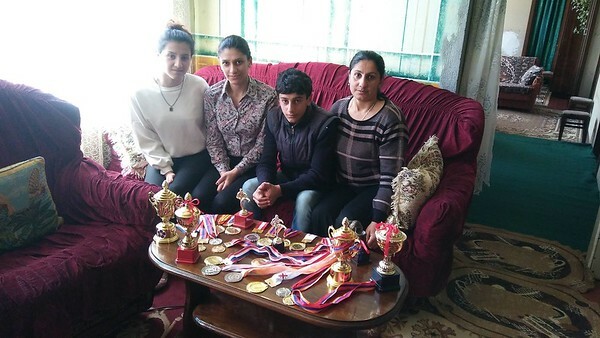 A CASP beneficiary since 2007, Sos’s financial aid goes toward the purchase of boxing equipment, as Anjela wants to do everything she can to support her son’s dream. Eight-year-old Genadi and ten-year-old Svetlana Levins also live in Javakhk. Now in the fourth grade, Genadi is fond of physics, chemistry and math studies and attends Armenian language and national dances clubs. Svetlana, a sixth-grader, has a number of favorite subjects, including mathematics, English and history. She wants to become a designer and now designs and sews clothes for her dolls on her own. Svetlana also participates in a number of extracurricular activities, like dancing, drawing and sewing classes that are offered at the local cultural center. Four years ago, their father Hovhannes died in a car accident at age 38. In 2015, Genadi and Svetlana were accepted into CASP which means that their mother Oksana, 35, will receive financial support from a U.S. family until they both turn 18. Last year, Oksana used their stipend to renovate their room.